Microsoft and OETC have collaborated to put together Microsoft licensing bundles that enable educational organizations to work on mobile platforms, using cloud technology and a secure environment. These licensing options were created based on feedback provided by OETC Members, with the direction of industry and digital transformation in mind. This option is geared towards OETC Members wishing to join the Microsoft purchasing consortium and want to license one of the following: Microsoft Core CAL Suite, Enterprise CAL Suite, Windows for Education, or Office Professional Plus. Requires a minimum of 20+ FTE to join. Choose one of the components shown in the table above. This licensing is the most popular among OETC Members. 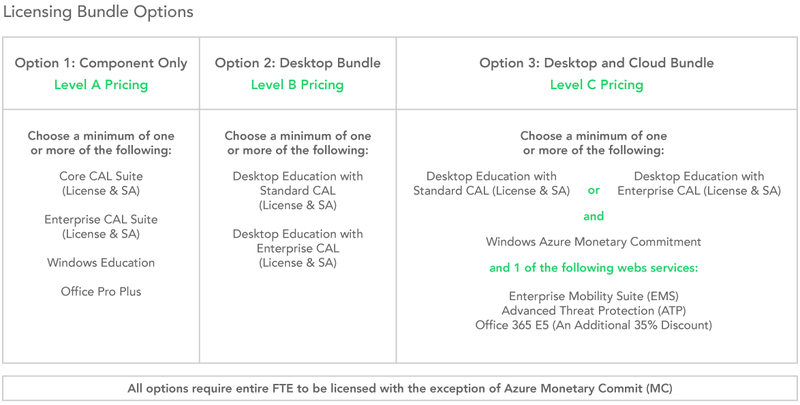 Take advantage of level B (usually a 3,000 FTE minimum) pricing by licensing with just 20+ FTE and choosing either the Desktop Education Standard CAL or Enterprise CAL. Choose one of the CALs shown in the table above. Microsoft created this bundle for OETC Members interested in cloud technology for their organization. This bundle is not a complete cloud solution. Test cloud solutions in your environment by licensing your Desktop CAL (Standard and Enterprise options available), as well as Windows Azure Monetary Commitment, and one of the web services offered. Choose one of the CALs listed above. Add Windows Azure Monetary Commit. Add one of the web services shown in the table above.